The Pastors Conference is excellent all the way around. I was refreshed, inspired, and challenged. Kevin DeYoung’s message on Preaching was filled with wisdom for preachers old and new. I had the opportunity to speak on the Holy Spirit and covered three areas: the Personal Spirit, Powerful Spirit, and Creation-Perfecting Spirit. Most of this content will be available in my forthcoming book, Here in Spirit: Knowing the Spirit who Creates, Sustains, and Transforms Everything. It’s easy to go to a church gathering. It’s easy to sit and listen to a thirty to forty minute sermon. It’s easy to take communion and receive forgiveness for our sins. What’s hard is valuing all of that, putting it to work to show the real treasure of God’s Word in our lives. We may want to avoid obedience because we think it’s more rewarding, but it never is. Or we may think we’ll be more secure if we don’t take the Word to heart and risk acting. Or we may think we need more insight, but more often than not we need action, to act on the insight that’s been given, to express the obedience of faith, which shows the difference Christ really makes. Our problem is that we often fail to act as we know we should because we do not believe sufficiently to launch out on the bare word of our promising God. Yet nothing can be more certain or secure. When God applies his word to our lives in regard to something he is calling us to do, we must begin to do it, in the strength that he supplies, as soon as we can. Our temptation is to wait and then ask for further light, without acting on the light he has already given us. But all I need to do for my heart to Harden after.God has spoken in his word, is…nothing! A life that trusts and obey is a life that he can use. Biblical Epistemology – My prolegomena helped me grasp how a Biblical worldview in intellectually credible. The writings of John Frame and N.T Wright on critical realism helped me grasp a way of looking at the world that is neither naive or nihilist. We can perceive what is true, through reason, the Spirit, and the Word, but not all we say is true. This enabled me to press into a pluralistic context like Austin, Texas with the requisite humility and confidence. Systematic Theology – Showed me how the Bible is theologically coherent. Apparent contradictions and various texts can be harmonized to tell us something about the nature, character, and purposes of God. 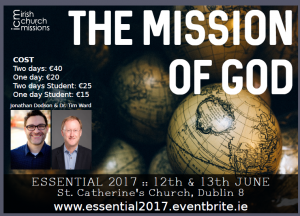 This enabled me to know God and answer some of the big questions regarding suffering, evil, election and so on. Hermeneutics – Enabled me to read and interpret texts well through propositional analysis, grammar, syntax, genre and so on. Discourse analysis was paradigm-shifting for me and taught me how to reason much better (Thank you Dr. Roy Ciampa!). This enabled me to read the Bible and other books well, to reason well cultural texts and claims, as well as biblical ones. Biblical Exegesis – I got to apply hermeneutics to the whole Bible with the guardrails of mentors in order to understand the author’s intent. Lots of Bible. I added a second degree to get more practice and more Bible! In particular, Greg Beale’s categories for OT in NT exegesis helped me grasp how to make sense of what the NT authors do with the OT. This launched me into the difficult task of showing the church, through preaching, that the two testaments are a whole. Biblical Theology – The above led me to read diachronically not just systematically, to read along the grain of Scripture so that the grand narrative of Creation-Fall-Redemption-New Creation is always my framework and Christ is at the center. Meredith Kline, Greg Beale, Sean McDonough were all a great help in this. Monotheistic Christology, the understanding that “Jesus is Lord” places Christ into the identity of YWHW simply blew my mind and still does.